The seven bells of Holy Trinity Cathedral are one of our great civic and ecclesiastical treasures. Five of the seven were a gift from Tsar Alexander III of Russia in thanksgiving for the miraculous preservation of his life (and those of his family) from an assassination attempt. Two other bells were locally recast by Garrett & Co. from older bells that melted during one of several fires that seriously damaged the temple in the course of the years. The Great Bell is also adorned with four icons: Christ the Savior, the Theotokos (Mother of God), St. John the Baptist, and St. Vladimir. Decorative lattice-work frames the icons and circles the bell in several places. The four smaller Russian bells are likewise adorned with decorative scrollwork, and two carry the name of Findlansky, the bell maker. The use of silver in the alloy and unusual tuning of the overtones gives Russian bells a distinctive sweet sound. San Francisco is very fortunate to have such a set of Russian bells, since few have survived, even in the Soviet Union, where they were confiscated wholesale and melted down for the making of cannon during the Revolution and World War II. Of particular interest is the story of the fortuitous preservation of the bells following the earthquake and fire of 1906. Shortly before the disaster the bells were removed from the church (then located on Powell street near Columbus). By this good fortune the bells were saved from the fire, which destroyed the Cathedral. When the new Cathedral was built in 1909, the bells were brought out of storage and installed in its tower. As part of a general restoration program for the “new” Cathedral in 1978-79, the old unreinforced wooden tower was replaced by a steel and concrete tower, designed to withstand any future disaster. The bells are rung manually, using ropes that cause the clappers to strike the sides of the bells, which themselves remain stationary. This permits the very complex patterns of tone and rhythm peculiar to the Russian style of bell ringing. The patterns are regulated by the rubrics of Orthodox Church services. The bells are rung before and after Divine Liturgy on Sundays and feastdays, as well as at the Vigil on the preceding evening. In fact, the bells are rung in one manner or another before all services and even during them at particularly solemn moments. Individual differences in the bells (and the bell ringers) tend to lead to particular regional or local styles of bell ringing. The trained ear can identify bells being rung in the style of Pskov or Rostov, for example. 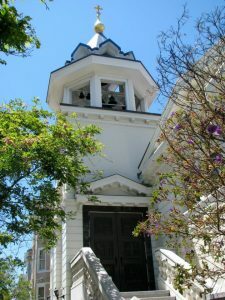 We at Holy Trinity would not be surprised to hear visitors from Russia tell us that they had heard the San Francisco style of bell ringing! If you can not see the play bar above, try clicking this link to download the wave file to your hard drive.